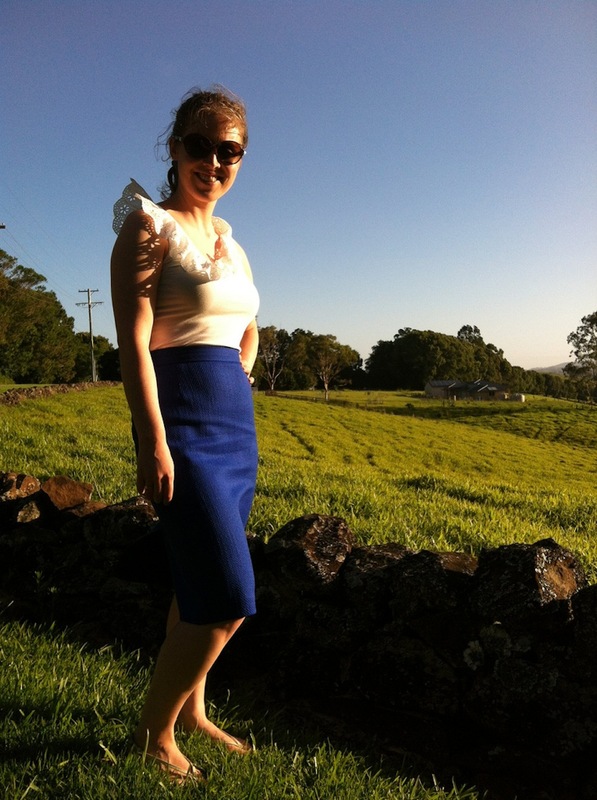 The second version of my most favourite pencil skirt pattern – Burda 8155. This time I actually followed the instructions most of the way through as I’ve kept the waistband – unlike my first iteration where I used a gorgeous bright red grosgrain ribbon (see the Technicolour Dream skirt here). Mum was gracious enough to take the above photo – after which I was promptly told to sit up properly. 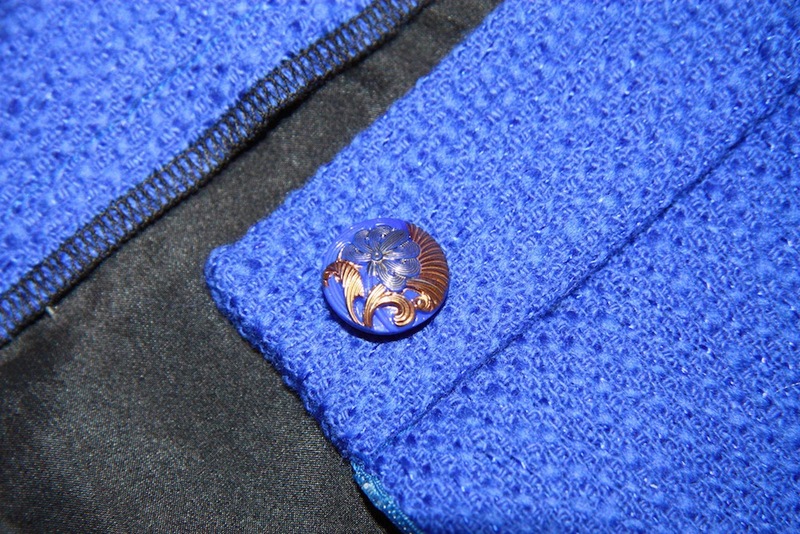 I bought a gorgeous glass button from Etsy, and used a bound button hole on the waistband – you can see my bound button tutorial here. 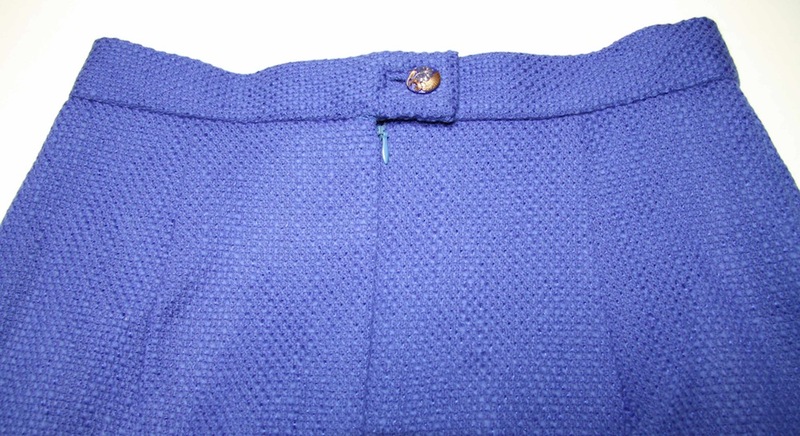 I found that had I left the length of the waistband as per the pattern (a size 38), it would have been too long. 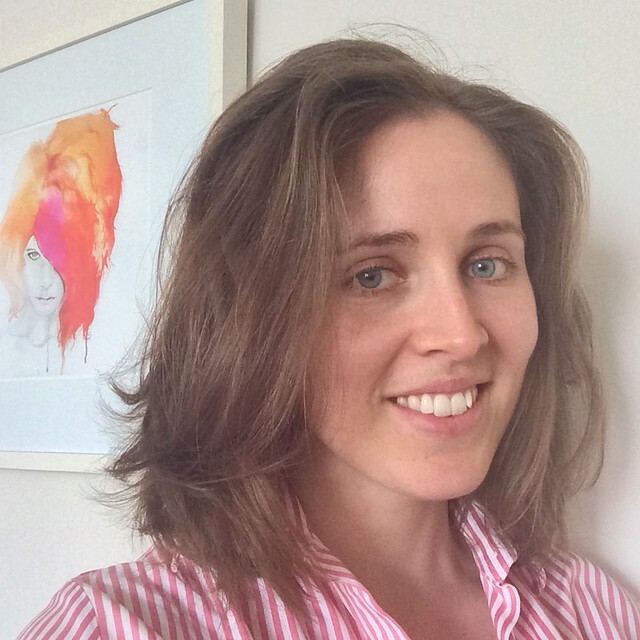 I cut about 6cm off the end – a much more manageable length! I ‘stitched in the ditch’ along the front leaving the seam allowance flat, reducing the bulk inside the waistband. 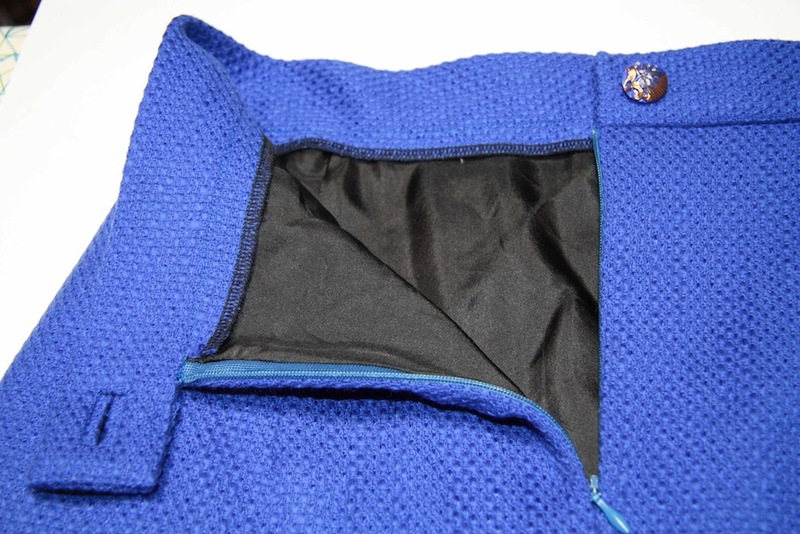 The wool blend fabric was quite thick – so this worked perfectly, and the texture of the fabric meant that it’s nigh on impossible to see the ditch stitching at the front. I used the French seam finish technique along both of the side seams of the lining – you can see a tutorial on that here. The fabric was a gorgeously soft royal blue basket-weave wool and nylon blend, by Alexander Wang and bought from EmmaOneSock. Beautifully thick and perfect for winter – lined in my favourite lining fabric – a black habotai silk. Shame I couldn’t get a zip with a colour to match quite properly… but one does the best with what one has! Royal blue is one of my favourite colours. That's a really nice skirt. It looks really great, and I love the technicolor version too! That blue is amazing. Incredible fit, too. Happy new year! Here's to many more wonderful makes this year! 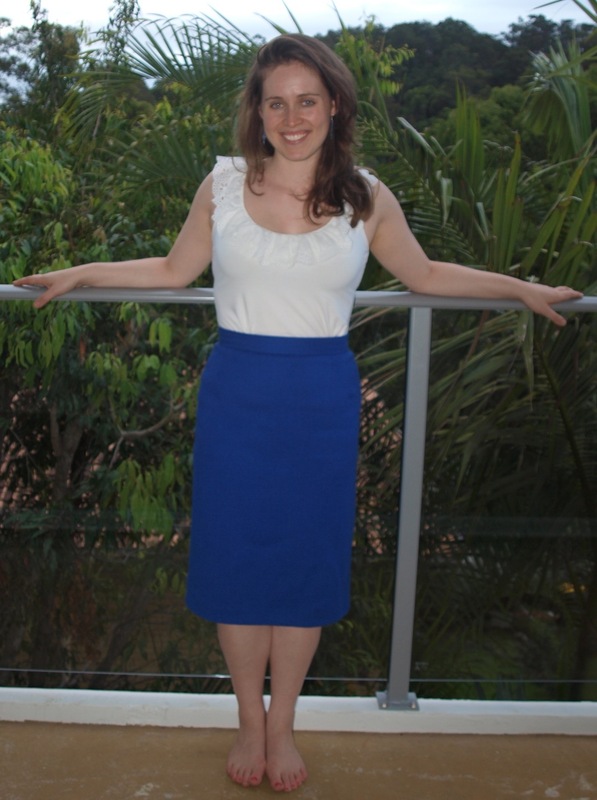 What a great skirt pattern – mine not done yet, you put me to shame!! New Year's resolution – get that list done. Oh – I got some cheap $3.00 nail polish and painted my zipper pull the colour I wanted – worked well. The fabric I've chosen for my girlfriend's skirt is very similar to your technicolour version – I really liked the grosgrain for the waistband – will use this feature for mine – thanks for sharing and have a fantastic 2012! 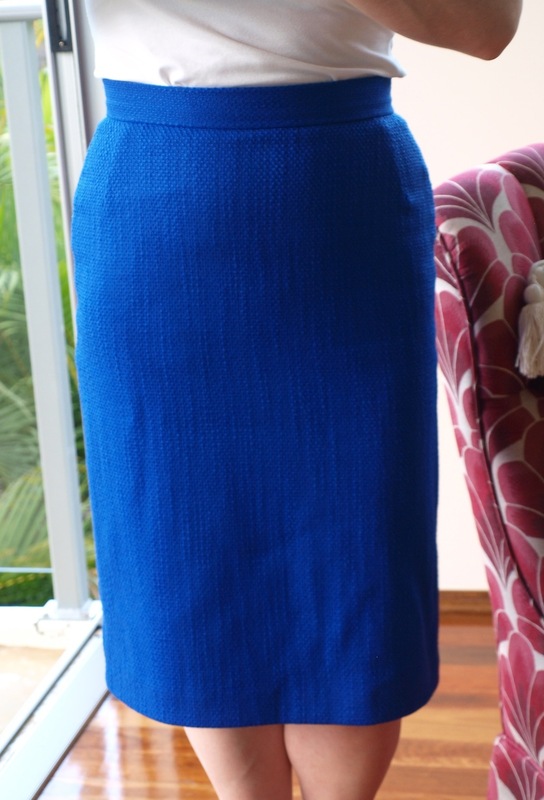 What a great fit, and beautiful blue fabric to boot! Thanks everyone! Evelyn, that's a fabulous idea – I'll definitely be trying that, and sooner rather than later!